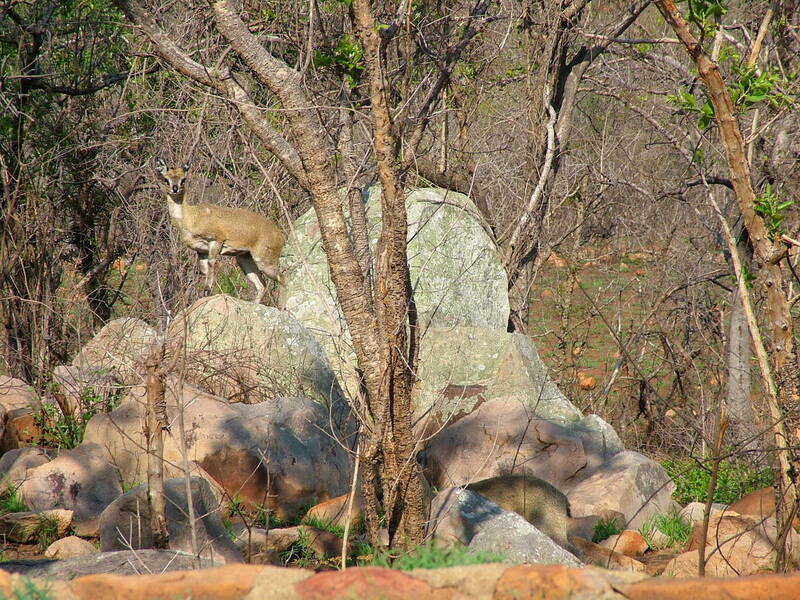 Bob and I had no sooner left the parking lot at Nkumbe Lookout when we spotted a trio of Klipspringer antelope gallivanting among the rocks on the other side of the road. What nimble little creatures! 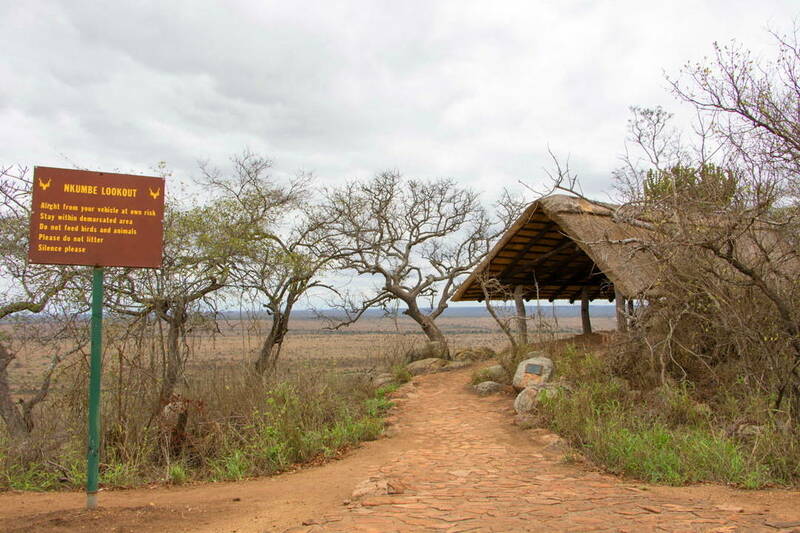 We had reveled in the sense of isolation and perfect silence that was found at Nkumbe Lookout in Kruger National Park, and took advantage of it for an opportunity to reflect on our travels in South Africa up to that point. Despite our expansive view of the savanna that stretches from there towards the west, we saw no signs of life on the open veldt. A Rock Monitor did keep us company as we savored some juicy nectarines, and then it was time to motor back towards Skukuza Rest Camp. 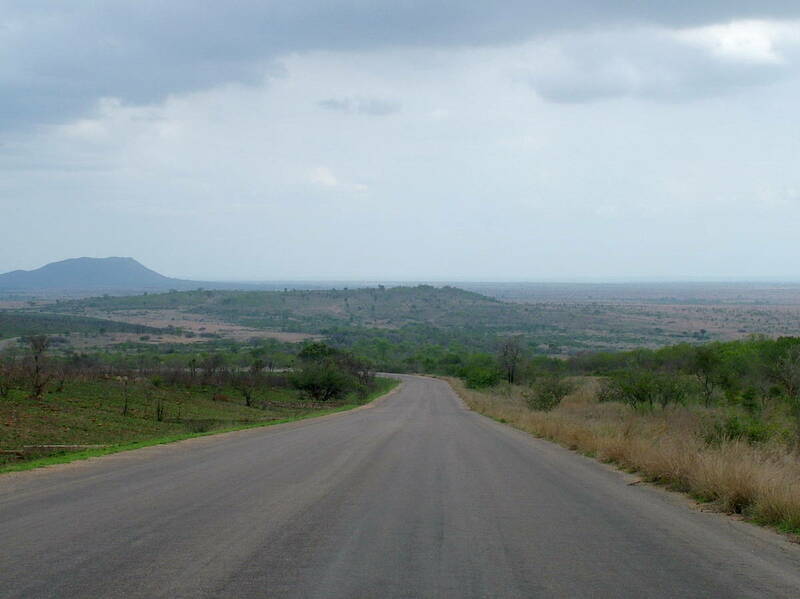 Barely back on the main road, we caught a flicker of movement off to our right where the landscape was covered in rust-coloured rocks of many sizes. Only for one Klipspringer antelope silhouetted against a pale grey boulder in the distance, we might have missed spotting the spry creatures altogether. There are 3 of them in this photo. Can you find them? 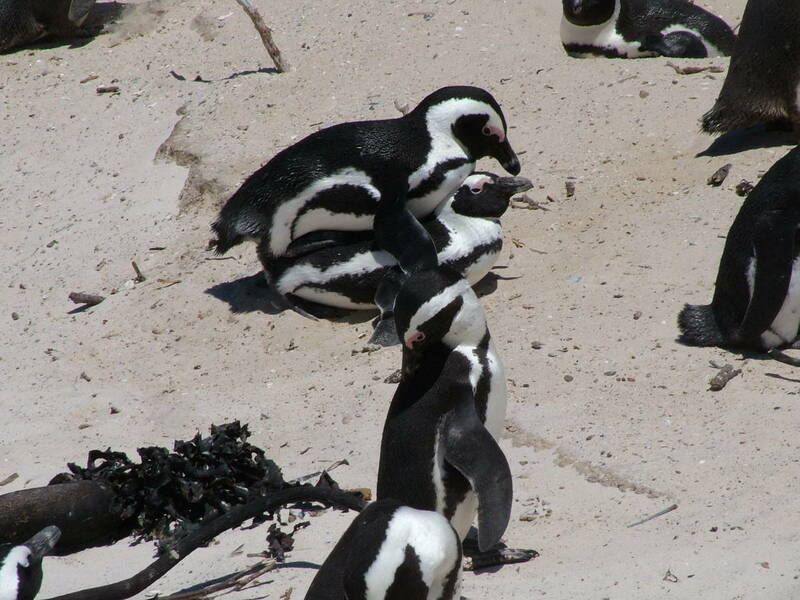 While the male, female and calf deftly scampered over the rocks, it was difficult to keep track of them. Their brownish-grey hair blended perfectly with the terrain. Klipspringers are stocky antelopes with a short neck and body, and their hindquarters are well developed, large in proportion to the rest of their body, giving them an advantage when leaping among rocks, in gorges and on cliff sides. 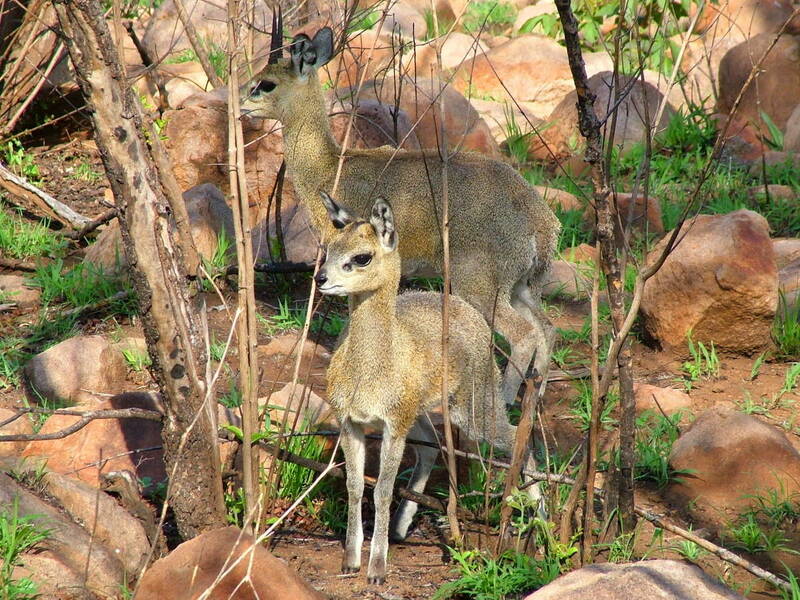 A Klipspringer antelope measures up to 24 inches at the shoulder with the females being slightly larger than the males. What is most fascinating is how the Klipspringers walk on their hoof tips, a gait that enhances their grip on uneven rocky surfaces. 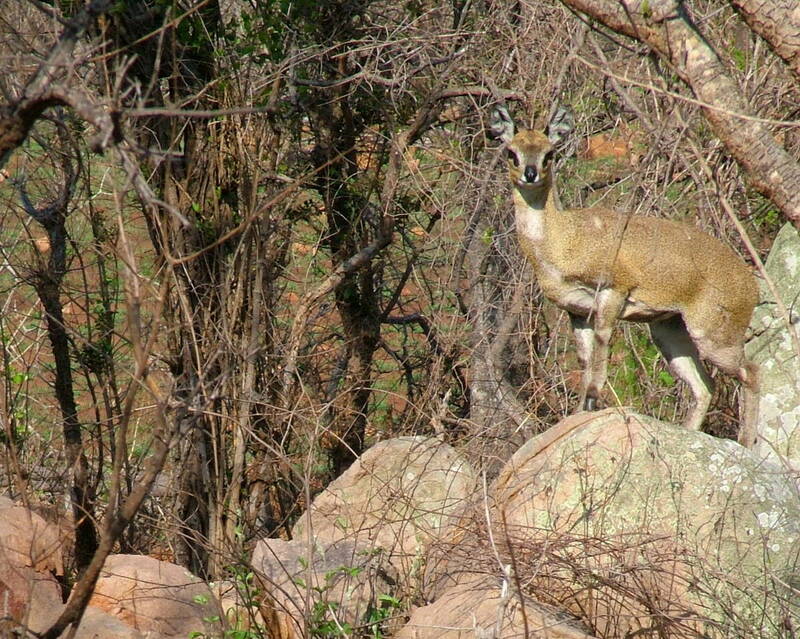 In fact, the name Klipspringer comes from the Afrikaans language and means “rock jumper”. 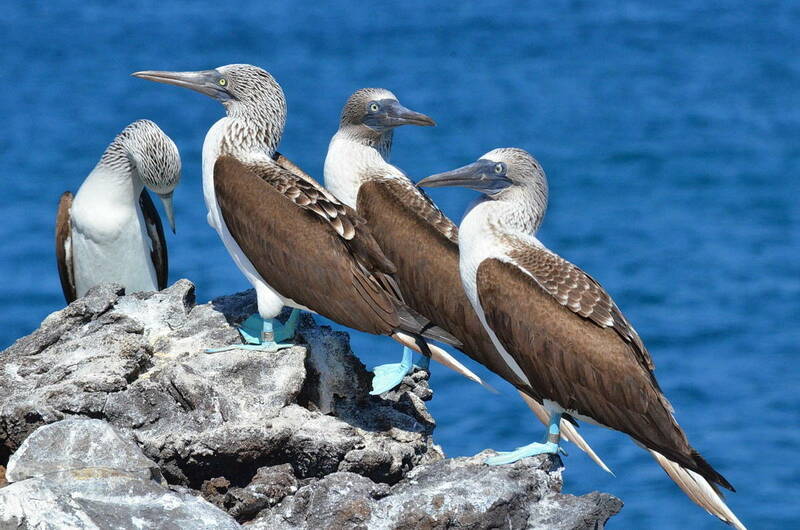 It was intriguing to observe them bounding from rock to rock because, each time, they landed on all 4 feet at once. Poised like elegant ballerinas on tiptoes, these small antelopes can actually scale sheer cliffs with no difficulty, an ability that enables them to escape predators. 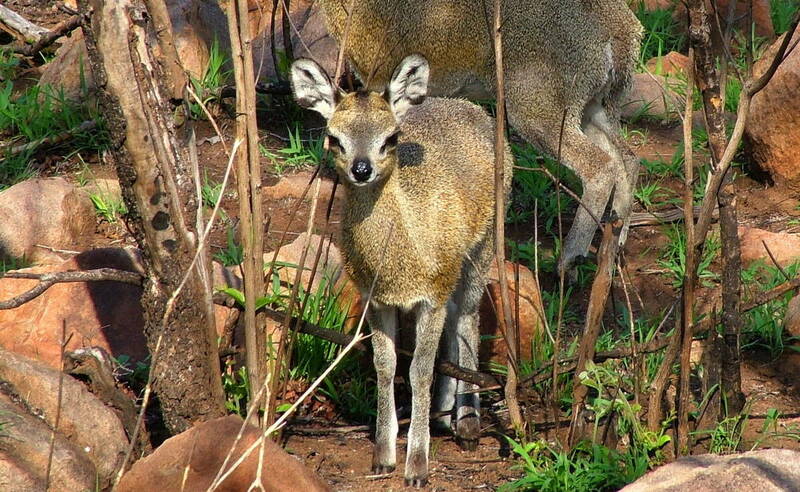 What makes the Klipspringer antelope particularly handsome are the prominent pre-orbital glands in front of their eyes lending a vulnerability to the Klipspringers’ overall appearance. Another characteristic that stands out are the white and black markings on the insides of the ears. 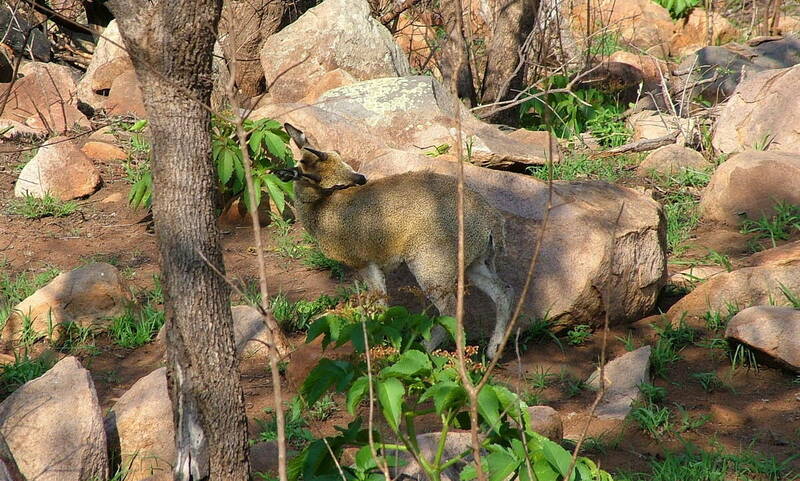 This draws more attention to the ears when they are flicked, perhaps in warning to other Klipspringers. 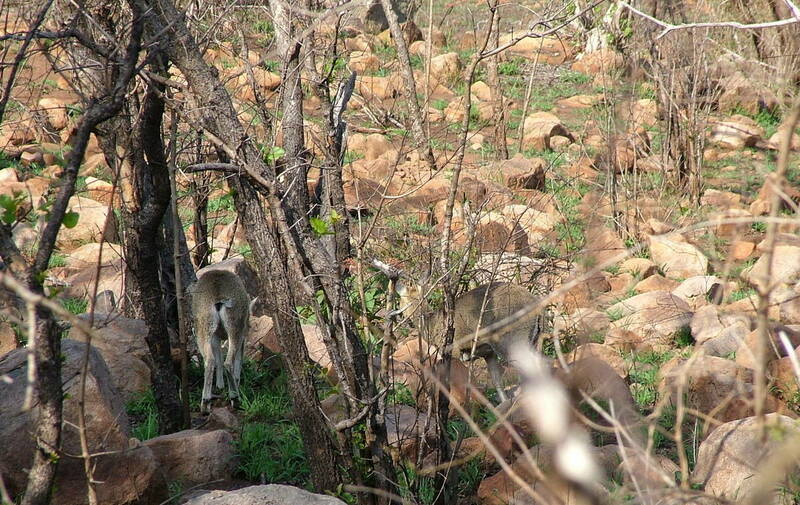 Klipspringers are normally inactive during the hot afternoon, so once again luck was on our side to find this family out foraging in the late afternoon. 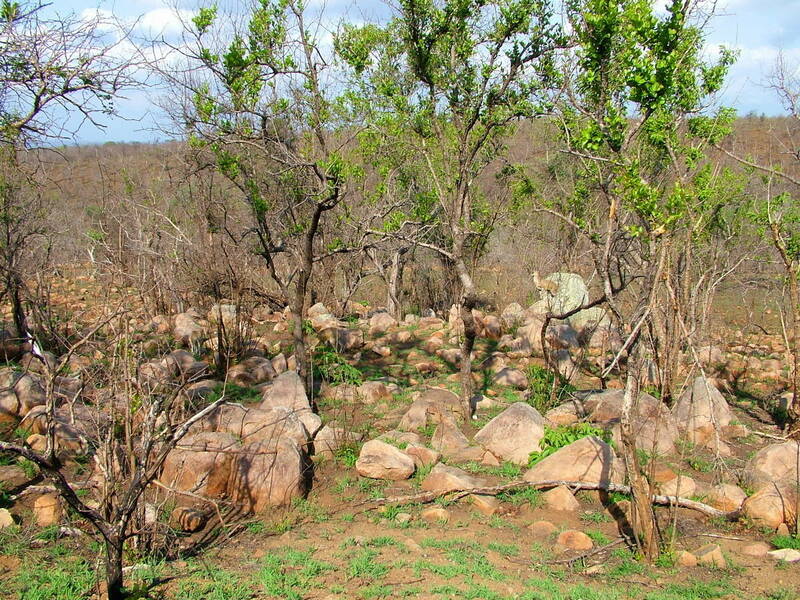 Their preferred habitat only provides a variety of sparse vegetation with flowers, green shoots and low foliage making up the bulk of their diet. 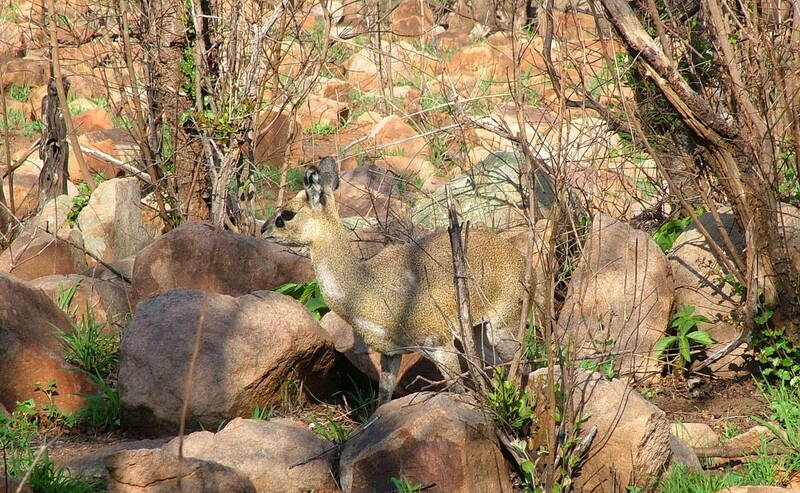 A Klipspringer’s water requirements are met by succulents rather than depending on a local water supply. 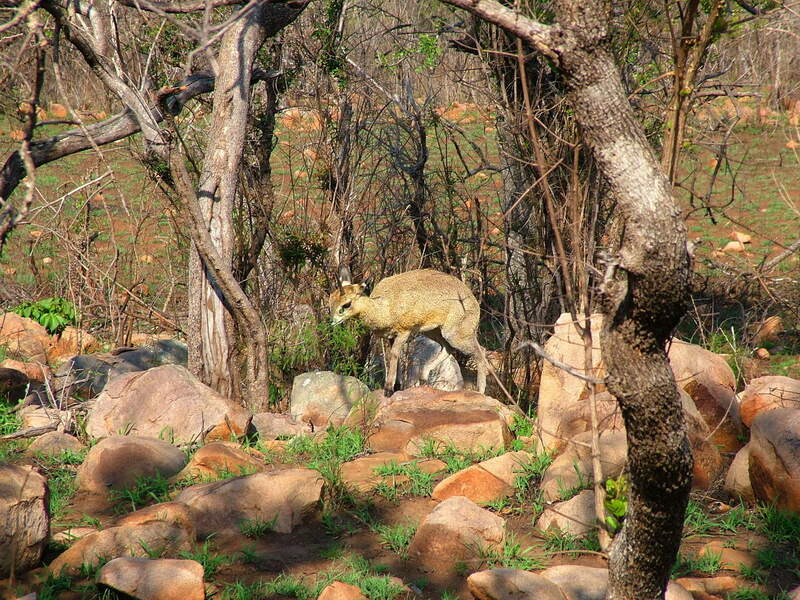 Most often, Klipspringer antelope are seen in a small family grouping with a breeding pair and one offspring. Only one calf is born each year, usually in spring or early summer, and it remains with the parents for one full year, until it reaches maturity. It was November 7th when we saw the Klipspringers, so this calf was likely born in August because the young are kept hidden for 2-3 months. In South Africa, only the males have short spiky horns, which are a mere 3 inches long. In other parts of Africa, both the males and females have horns. This may allude to the fact that there is less competition in South Africa. Another trait peculiar to most antelopes is a dense coat of hollow hairs that rattle when they move. The hair serves multiple purposes. 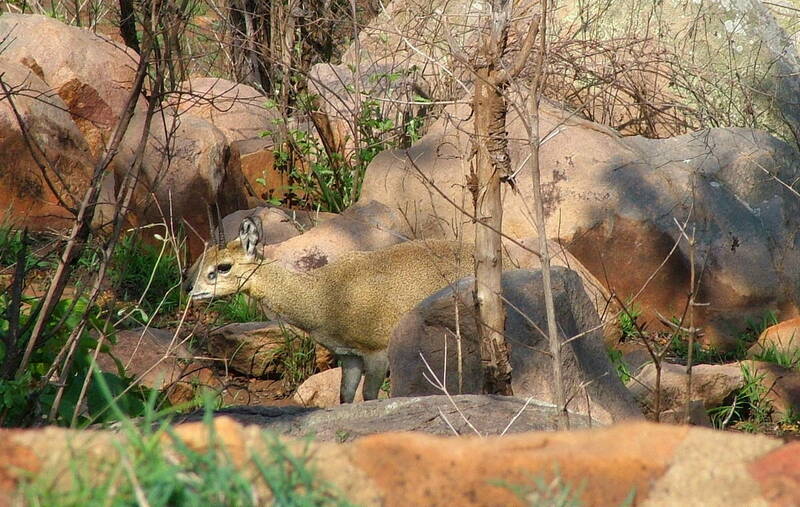 One, it protects a Klipspringer from abrasion when brushing up against rough and sharp rocks. Two, the hairs stand up when the animal is hot and assist with distribution of heat. When laying flat, the hairs deflect the sun’s rays. If a Klipspringer takes a fall, the springy texture of the coat cushions the animal. Did you notice that there are 2 animals in this photo? As the hour was getting on, we had to make tracks for Skukuza Rest Camp. The gates close at 5 p.m., so we had to return to the compound by then to ensure our own personal safety through the night. Tomorrow would be another day with the gates opening promptly at 4 a.m. for those of us keen enough to be awake by that hour.